We first received this large and gorgeous orchid as an Easter Gift on April 13, 2015 from some dear parishioners from the Church of St. Francis of Assisi in Cheras. How very thoughtful and caring they were, knowing that I was unwell and needed cheering up. It bloomed again just less than two months later with our tender loving care. We were wonderfully surprised and delighted! The Orchid Island of Taiwan is named after the genus. 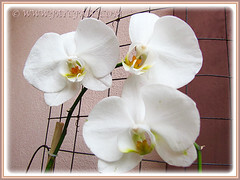 Botanical Name: White Phalaenopsis Orchid cv. aphrodite. 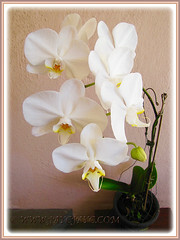 Common Names: Moth Orchid, Phal. 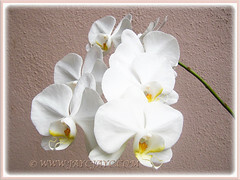 Etymology: The generic name Phalaenopsis in Greek is given by Carl Linnaeus to a group of large moths as the flowers of some species resemble moths in flight. Origin: Native to southern China, Taiwan, the Indian Subcontinent, Southeast Asia that includes Thailand, Philippines, Malaysia, Indonesia etc., New Guinea, the Bismarck Archipelago and Queensland. 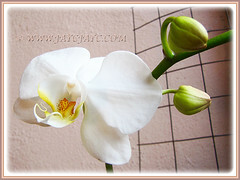 Plant type: An ornamental and tropical flowering plant. 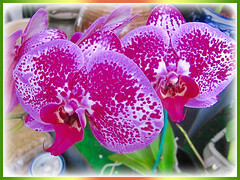 Features: Phalaenopsis is an orchid genus that consists of about 60 species with numerous hybrids and cultivars. 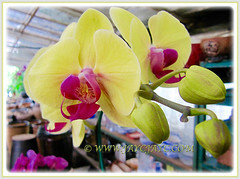 It is one of the most popular orchids in the commercial trade and loved by gardeners and florists alike. A tropical flowering perennial herb that flowers throughout the year under ideal growing conditions. 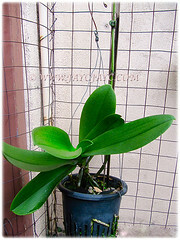 It is somewhat fast-growing and can reach 15 cm to 1 m in height. 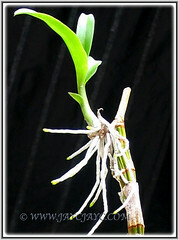 If very healthy, a Phalaenopsis plant can have up to ten or more leaves. 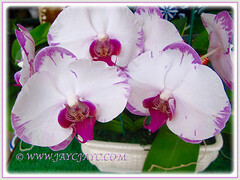 The blooms of Moth Orchids are hardy and long-lasting, may last about three months or more. They come in numerous colours with varying hues of yellow, white and pink, as well as spotted or speckled too. Of course, excluding the blue colour. 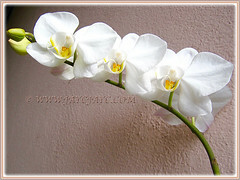 Culture (Care): White Phalaenopsis Orchid grows moderately easy. Light: Best in bright light or filtered indirect sun. It requires to be protected from direct sunshine that may scorch the leaves. Moisture: Moderate water needs. It prefers moist soil. They do not have water storage organs, thus they like to be kept lightly moist at all times though not sitting in water either. Water regularly for optimum growth. Soil: Best in a mixture of pieces of charcoal, broken bricks, coconut husk fiber as well as well-drained soil. Others: Once the flowers have withered or faded, cut the flowering stalk back to just above the second joint that is visible beneath the spent blooms to encourage the development of a new flowering spike. 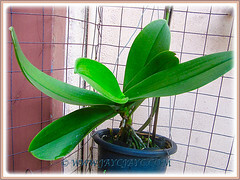 Feed it once monthly with an orchid liquid fertiliser. 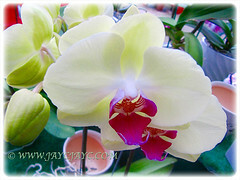 Mist the Moth Orchid often to keep the foliage dust-free. Generally free from serious pests and diseases, though do watch out for mealybugs, slugs and snails. For subtropical and temperate regions: Hardiness: USDA Zone 8-11. A tender perennial that needs a minimum temperature of 16°C. 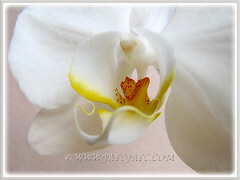 Mist the Moth Orchid often to keep the foliage dust-free. Reduce watering slightly in winter. Feed it with a liquid orchid fertiliser during the growing season. Also, flush the plant regularly to prevent harmful accumulations of salts. Feed sparingly during winter. Avoid draughts and fluctuating temperatures. Propagation: Best to propagate by separating the tiny plantlets or keikis that emerge from the parent plant. Check it out at Homeguides. 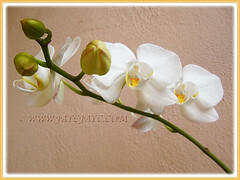 Usage: Phalaenopsis Orchids have many uses. They look great in hanging pots/baskets and raised planters. They are captivating ornamental plants that’s ideal for any garden. Horticulturists and florist just love them as they come in numerous fascinating colours. 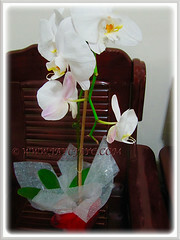 Excellent for floral arrangements at parties and popularly used in bridal bouquets. Flowers are hardy and long-lasting that will brighten your indoors.